The 1960’s made a lot of cultural contributions; the Beatles, Hippies, psychedelic colors, and granola come to mind. 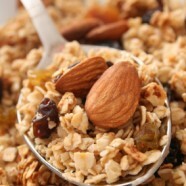 Granola is a great breakfast food. It’s yummy, high in fiber, full of oatey goodness (which supposedly lowers cholesterol), and versatile (you can have it hot or cold, with fruit, yogurt, or just as a snack. This recipe will get you started, but you should feel free to play with it for variety or to suit your family’s tastes. Add diced dried fruit instead of raisins, change the sweetener to real maple syrup, and experiment with different nuts and grains. In large bowl, mix together oatmeal, almonds, coconut, sunflower seeds, and flour. In saucepan, heat water, oil brown sugar, cinnamon, nutmeg, salt and honey just to boiling. Add vanilla and toss with dry ingredients. Turn out onto cookie sheet and bake in thin layer at 300F for 50 to 60 minutes, turning every 10 minutes for even browning. Remove from oven; add raisins; cool and store in airtight container. Per Serving: 338 Calories; 17g Fat (43.7% calories from fat); 9g Protein; 41g Carbohydrate; 6g Dietary Fiber; 0mg Cholesterol; 96mg Sodium. Exchanges: 1 1/2 Grain(Starch); 1/2 Lean Meat; 1/2 Fruit; 3 Fat; 1 Other Carbohydrates.